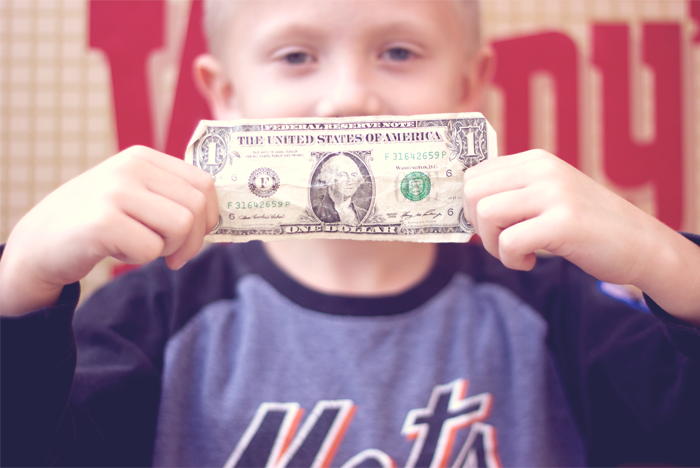 Wanna know what you can do for $1? This kind boy let me take his photo. I told him I am blogger and I love adoption and I forgot my wallet in the car so let me haul these four kids back out there, just gimme a sec. If he's your brother, your friend, your son, or your cousin: He's precious. My kids loved him. 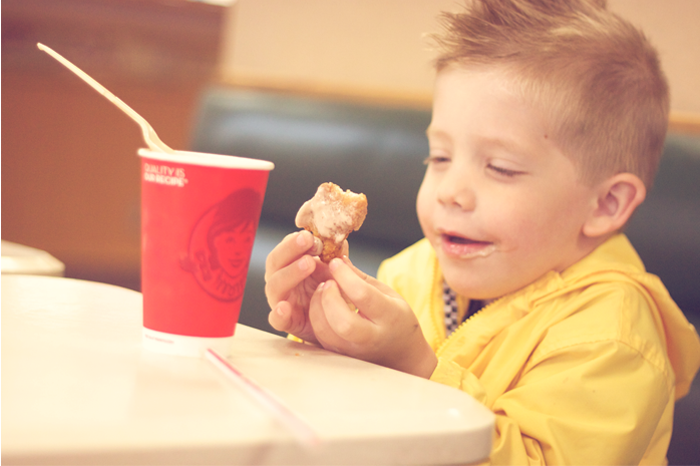 Foster's favorite life experience thus far: chicken nugget submerged in a Frosty. Hundreds of thousands of children are living without permanent families in the United States today, and hundreds of thousands of these precious children are eligible for adoption. I want to shout from the rooftops what a gift adoption is our lives every minute, every hour, and every day. It has opened my eyes, opened my heart, and blessed our family in more ways than I can write out. I do know that adoption is not for every family but I also know that every family can be FOR adoption, supporting children waiting to be adopted, and families waiting to adopt. Having a heart for adoption doesn't start with fundraising and end with a child being placed in your arms. It is your actual heartbeat. It's something to live out every single day. So often, whether pursuing adoption for their own family or not, people wonder where to begin, or how to help when it comes to adoption and foster care. Today I am so happy to share with you one way you can help. Tears welled up in my eyes as I spent time reading more about The Dave Thomas Foundation for Adoption. I love their mission statement with my whole heart. 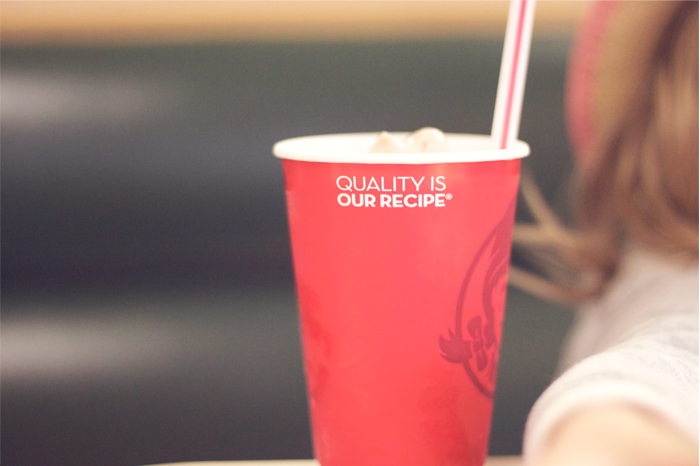 It's bold, it's brave, there's no frills and no fuss. "Every child will have a permanent home and a loving family." Let me repeat that, EVERY CHILD. Every single child is adoptable. 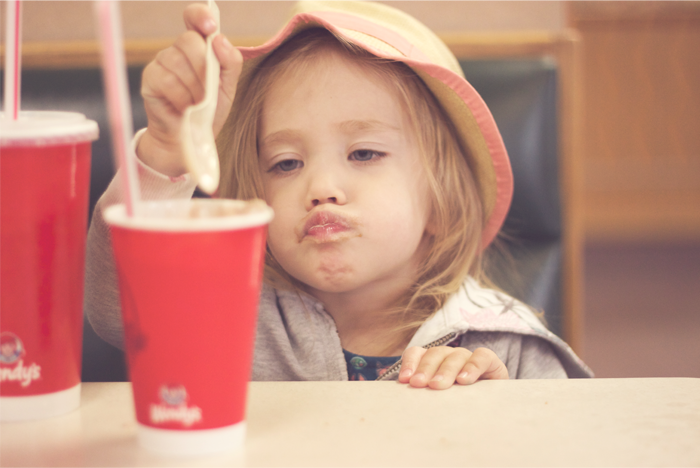 "Wendy’s is able to help children waiting in foster care adoption by contributing to the Dave Thomas Foundation for Adoption signature program, Wendy’s Wonderful Kids. These recruiters use a centric approach, working on caseloads of children the system has forgotten, ensuring they have the time and resources to give each child the attention as he or she deserves. The Foundation funds 201 adoption recruiters working for children throughout the U.S. and Canada. 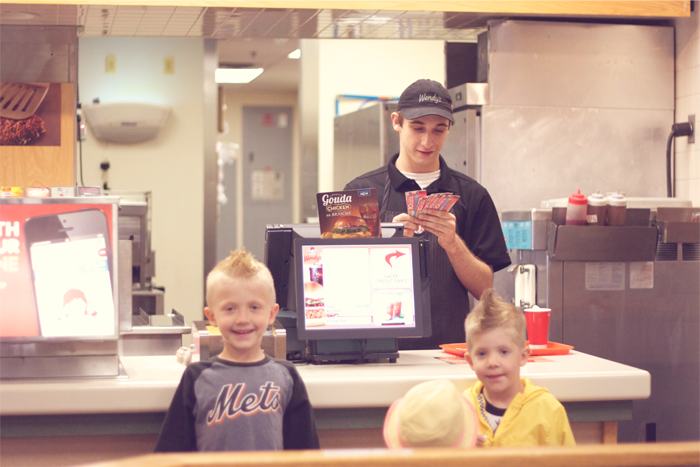 The program has helped thousands of children be adopted by their forever families." 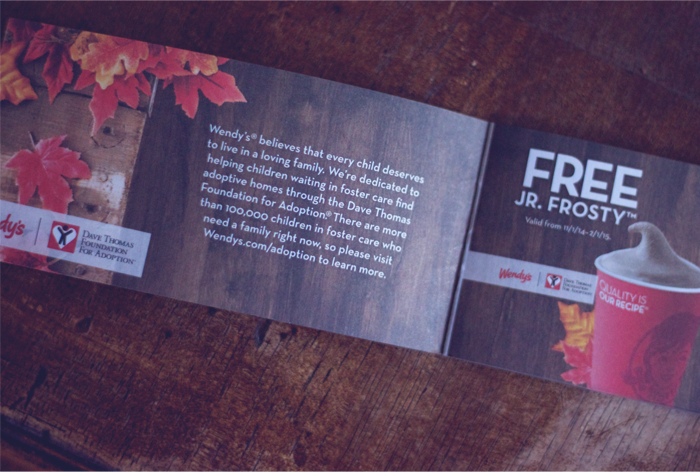 Every year, Wendy’s sells Halloween Frosty™ Coupon Books and gives $3 million ($3 MILLION!) 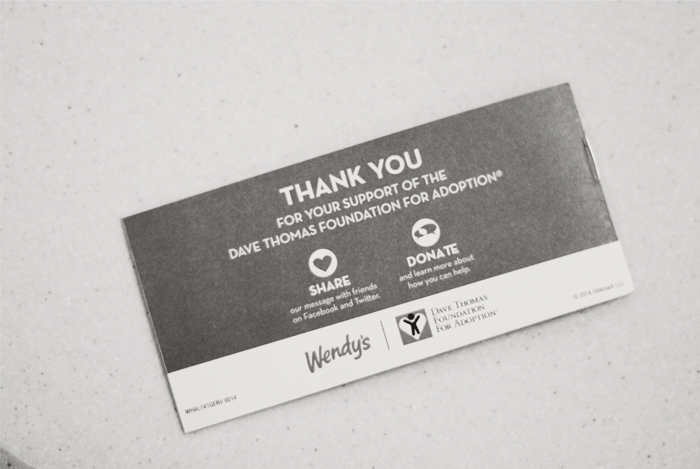 of the profit to the Dave Thomas Foundation for Adoption. 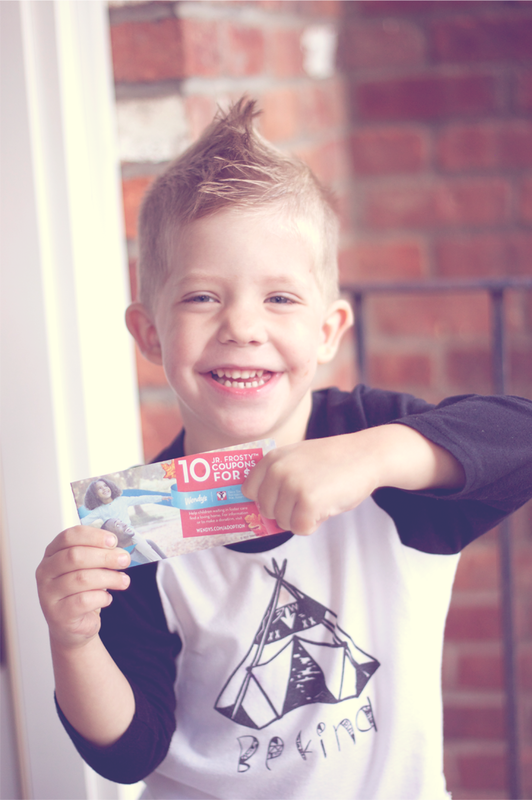 The coupon book is only $1 (one dollar!) 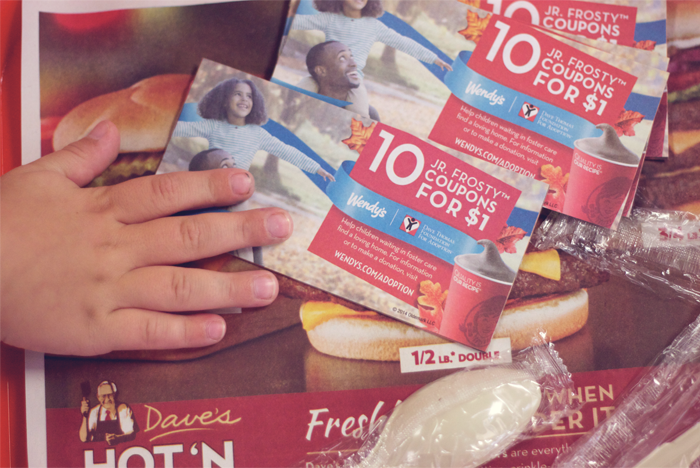 and includes coupons for 10 free Jr. Frostys. I mean, come on! I want us to get creative. 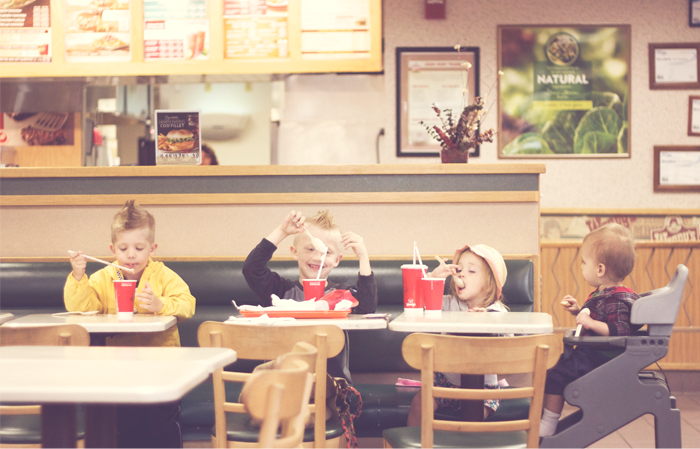 I want us to keep the adoption conversation going with our children as they wait in line at Wendy's to buy their coupon books. I want our children to give them to their friends and for us hear them speak back the things we have been teaching them about adoption. I want us to hand these out to trick or treaters, I want us to stuff them in Christmas stockings, I want us to take that $10 bill out of our back pockets and go buy ten more. 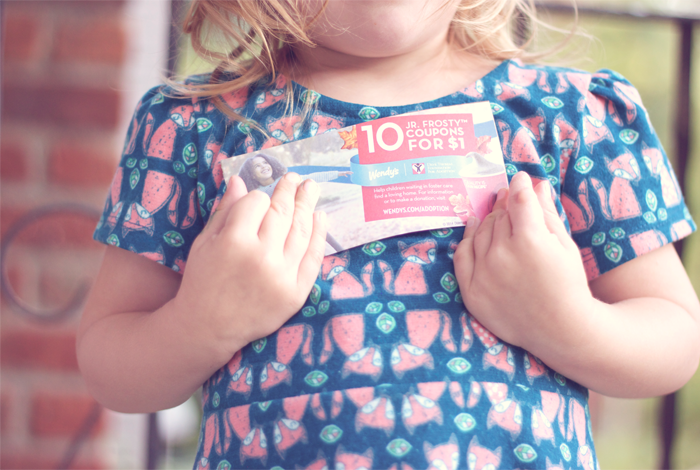 I want us to hand them out at pre-schools, and in kindergarten classrooms, and just flood the people around us with free Frostys in the name of adoption. In the name of foster care. In the name of love. In the name of finding every child a permanent home and a loving family. Won't you join me? This post was sponsored by Wendy's but all thoughts and opinions stated here are my very own.